The United Way of Aroostook hosted its annual meeting June 12 with a breakfast held at the University of Maine at Presque Isle Campus Center, with more than 100 attending. 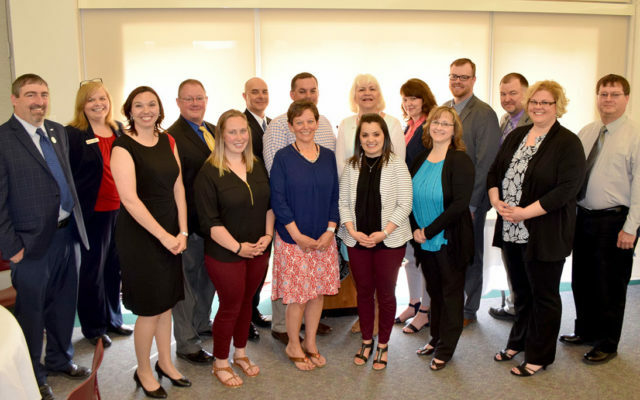 PRESQUE ISLE, Maine — The United Way of Aroostook hosted its annual meeting June 12 with a breakfast held at the University of Maine at Presque Isle Campus Center, with more than 100 attending. United Way staff highlighted donors, businesses and organizations which support its work, and also announced the 18 agencies it will help to fund along with three special programs it will support with grants. UWA installed a new president, vice president and board members. Outgoing president Luke Rossignol handed over the reins to new board president Wanda Guiggey. John Gulliver is the new vice president. Newly installed board members are Scott Amero, Lydia Kieffer-Till, Ben Lothrop and Denise Plourde, who join current board members Kathie Beaulieu, Alain Bois, Nicole DiVito, Bonnie Foster, Ryan Guerrette, Tony Lahey (treasurer), Jennifer Levesque, James Mattila, Bill Schofield, Laura Turner and Sue Watson. Dan Bagley and Cheri Doak are honorary members. Guiggey discussed the importance of volunteerism to United Way. In the last 12 months, United Way volunteers have logged over 3,000 hours of service. Cheri Doak, senior vice president at KeyBank, NA, received the Volunteer of the Year Award for serving United Way in many distinct roles, on the board and as president from 2012-2014. She has been a leader in the organization, helping to facilitate the move to the greatest impact model. Guiggey added that UWA could not do the work it does without the financial support of its many donors, especially its workplace campaign donors. The top 10 workplace campaigns were, in order from 10 to 1: Central Aroostook Association, Smith and Wesson, Twin Rivers Paper Company, United Parcel Service, The County Federal Credit Union, Key Bank, The Aroostook Medical Center, Emera Maine and MMG. Campaign co-chair Jess Ouellette presented a special award to Emera Maine for its dedication to the mission of United Way. Their organization increased employee giving by 50 percent, has a corporate match of 100 percent of employee giving, and has individuals donating $500 or more. They support several United Way Programs and sponsored this year’s “Pump It Up Aroostook” incentive contest for donors. President Alan Richardson and several employees accepted the award on behalf of the company. Guiggey and campaign co-chair Gulliver presented agencies with their funding packages. Nonprofit agencies applied for funding back in March and the Fund Distribution Task Force, made up of community volunteers, determined which agencies would receive funding and at what level. Funds will go to: ACAP’s Child and Family Services; ACAP’s Woman, Infant and Children’s program; Adopt-A-Block of Aroostook; Aroostook Council for Healthy Families-Maine Families Aroostook; Aroostook Council for Healthy Families-Raising Stronger Families; Boys and Girls Club of Presque Isle; Central Aroostook Association; Hope & Justice Project; and St. John Valley Associates. Agencies and programs which support seniors will receive funding, including: Aroostook Area on Aging-Nutrition Services and Aroostook Area on Aging-Aroostook RSVP, and Putnam House. The following agencies and programs which help to meet basic needs and support self-sufficiency also received funding: ACAP-Workforce Development with Aroostook Mental Health Center; American Red Cross; Catholic Charities Hunger Relief Services; Grace Interfaith Food Table; Homeless Services of Aroostook; and Salvation Army. Aid for Kids, The Northern Lighthouse and AMHC Child Advocacy Center received special partnership grants. Executive Director Sherry Locke wrapped up the meeting, thanking the community for its support as United Way evolves to create the greatest impact. She also thanked the donors, businesses and organizations for helping to increase the reach of United Way of Aroostook. Submitted by the United Way of Aroostook.